SAULT STE. 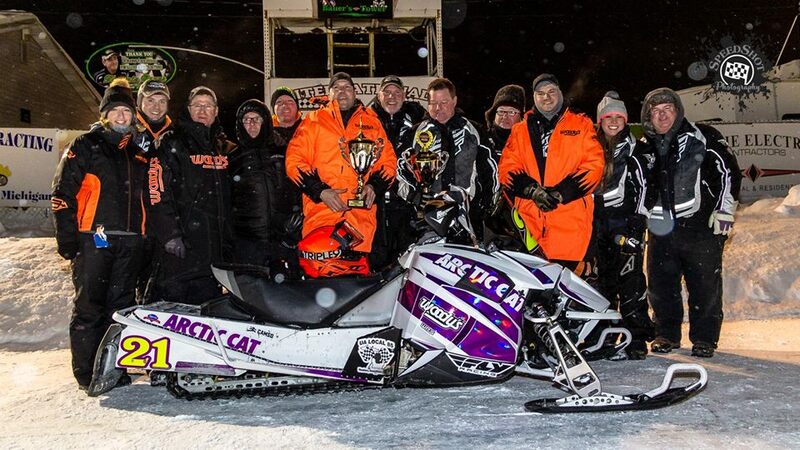 MARIE, MI – Jan. 31, 2019 – Troy DeWald goes to victory lane for the third year in a row in the Woody’s Challenge. 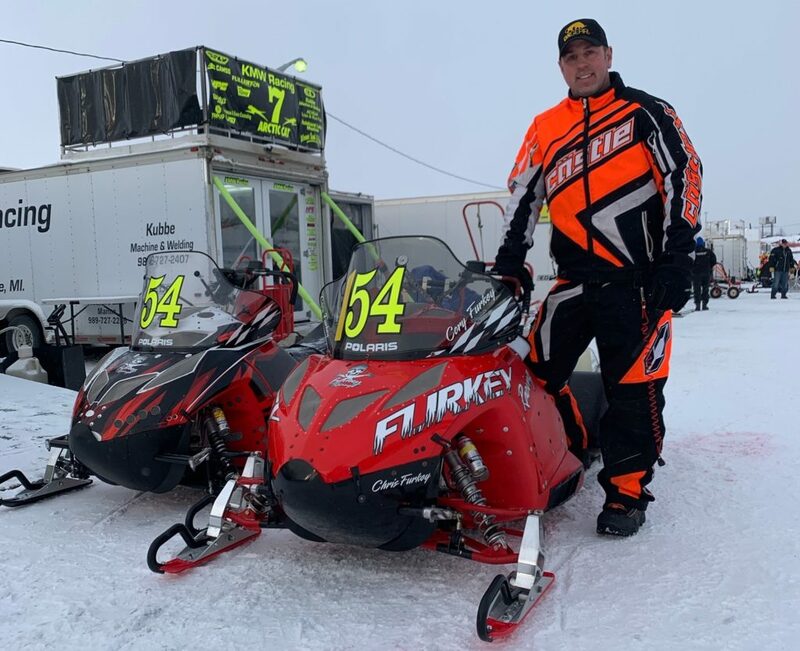 The 49-year-old veteran from AuGres, MI who earlier in the afternoon won his third consecutive & 10th career International 500 Snowmobile Race Pole Award, earned a cool $2,000 for efforts for the day. 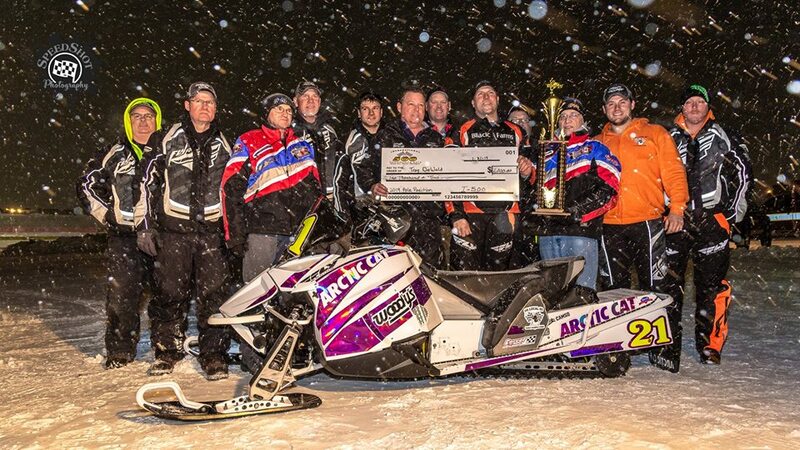 The rider of the Cadarette Collision Racing #21 / Arctic Cat – Snowmobiles entry led all 15 laps in the revised format for the 24th running of the Woody’s Challenge that saw Two Heat Races set the Feature starting field of eight. Earlier in the evening 19-year-old Rookie, Luke Krentz and DeWald scored Heat Race victories to advance into the Feature while 2004 I-500 Winner, Cory Furkey won the Woody’s Traction Products Pole Award with a 39.810 = 90.430mph. The 46-year-old from across the bridge in Sault Ste. 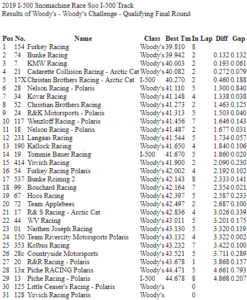 Marie, ONT laid down the quickest lap of the day in the Final Woody’s Qualifying Session and, as of press time, was not entered for the 51st annual I-500. 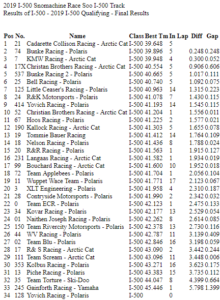 During the afternoon hours, DeWald has won his third consecutive & 10th career #SooI500 Pole, this one, for the 51st Annual International 500 Snowmobile Race. He went a 39.648 = 90.799mph on Tuesday and the time held up the rest of the week. 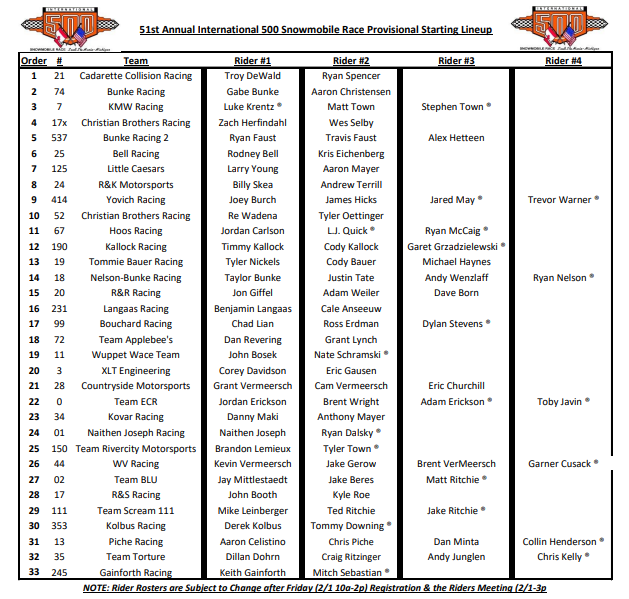 Seven-Time Race Winner, Gabe Bunke / Bunke Racing #74 will start on the outside of the front row on Saturday. Live P.A. Feed at the track on 91.1fm.